My grandfather was a typical Chinese man who loved his pork. One of my clearest memories as a child was of him enjoying his braised pork belly or pig trotter stews at our weekly Saturday night family dinners. My dad’s family lived in Malaysia and we used to faithfully brave the Causeway traffic every Saturday to visit my grandparents who lived together with my aunts in Johor Bahru. In those days I remember our car didn’t have an air conditioner and it was always a sweaty journey crossing the immigration check point to Malaysia. I think we never grumbled as children. We took these weekly forays as very much part of life. And when we got there we were like little monkeys let loose and would romp around the garden and through the house. 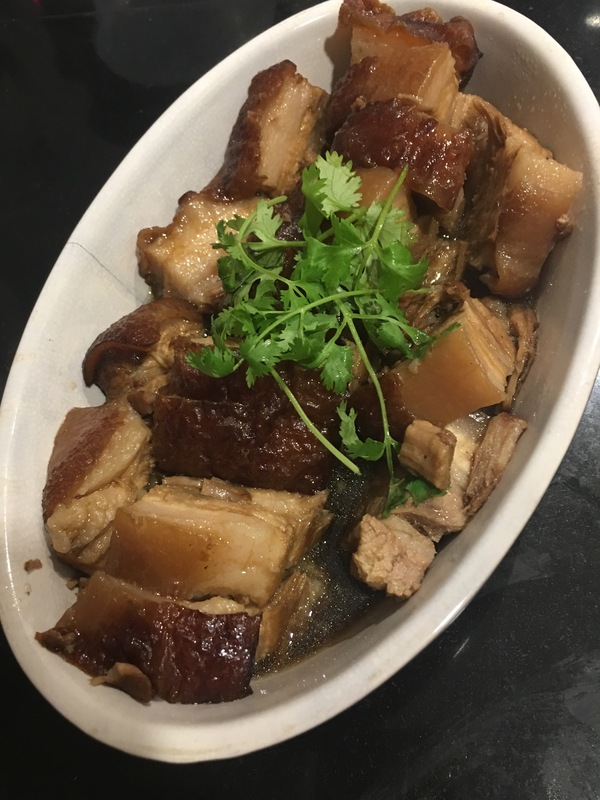 The reason why I remember the pork belly and pork trotter dishes is because somehow I didn’t quite like the oily richness of the dishes and started to avoid them. But how my grandfather loved his pork – he slurped up every dripping sliver of fat…oblivious to medical concerns to rein in his fat consumption. And he lived into his 90s and it was not the cholesterol that killed him but a congenital aortic stenosis or heart valve defect that he had had for many years. Years on I married a man who doesn’t really eat pork, but we will surreptitiously make our pork dishes when he’s busy working and not in for dinner. 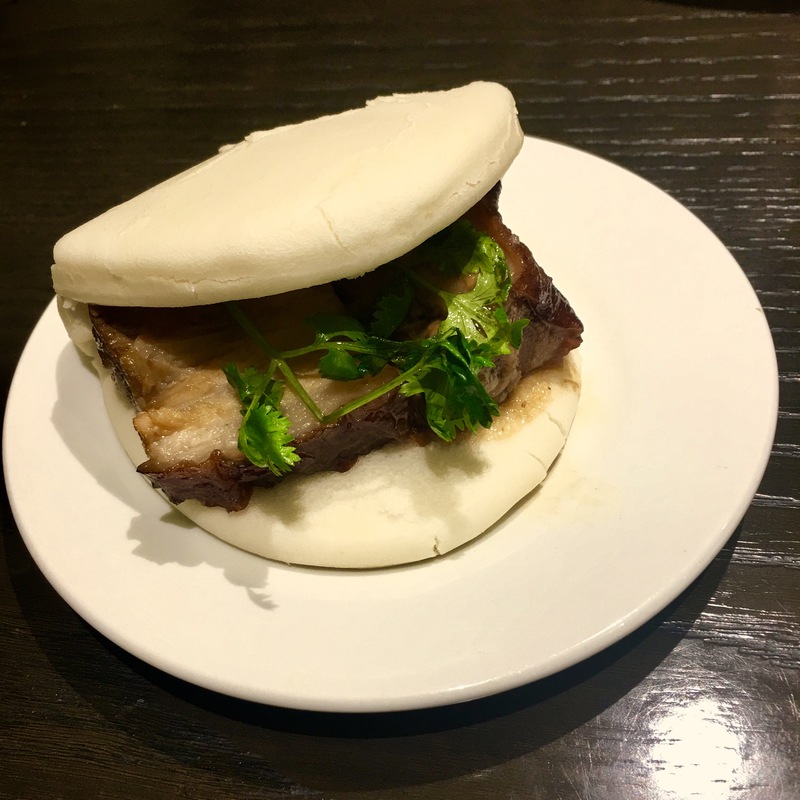 Kid#2 loves pork belly buns. This is one of her must haves when we go to Chinese restaurants. I decided to try this dish at home in the Instant Pot. Most recipes call for gentle simmering of the pork belly for several hours to get the melt-in-the-mouth textures, but I decided to try pressure-cooking to see if this could produce equivalent results. In the end the texture and softness of the pork belly was a clear pass. I felt however that the colour of the pork was lighter than a typical slow braise, which was why I ended the cook with a short period of simmering the cut pieces of pork belly. I used the pot-in-pot method of cooking here which cuts down the volume of fluid needed and hopefully a concentration of the aromatic flavours in a smaller volume. I think direct cooking without an extra inner pot may still be possible although the sugar content may scorch the base of the pot. I’m the end I was just happy that I finally got to use the nifty little pot in pot (it has handles too for easy lifting out of the Instant Pot). Some months back I had found this solitary piece in Robinsons department store and although it didn’t have a price tag, I really really wanted it because I knew it was a perfect Instant Pot insert. I chased down a sales lady who patiently went through the inventory listing to find out the price of the pot. In the end, she sent me off shopping and promised to call me back when she got the list price, and that she did, about 15-20 minutes later. It was well worth the wait as it fit snugly into the inner pot of my Instant Pot. I am deeply grateful for the lady’s determined search, which is why I still go back to Robinsons on and off for the odd piece of kitchenware. The staff are really good at helping. Metal insert for inner pot. A perfect fit for the pork belly. So at the end of the day I don’t think I am an expert at doing braised pork belly, but at least I can get a decent homemade version. I suspect grandpa would have approved. 400-500g pork belly, preferably with no pieces of cartilage at the base. I also used a squarish piece to be able to fit into the pot. Bring a large pot of water to boil. Blanch the pork belly. Rub 2 tsp dark soy sauce over the skin of the pork belly. In a wok or large skillet, heat up the peanut oil over moderate heat and place the pork belly, skin side down and crisp up the skin. Remove and set aside. Tie the pork with kitchen string to make sure it keeps its shape. Place a trivet into the Instant Pot and put in 1 cup of water. Place another metal container or heat proof container on the trivet (pot-in-pot method). 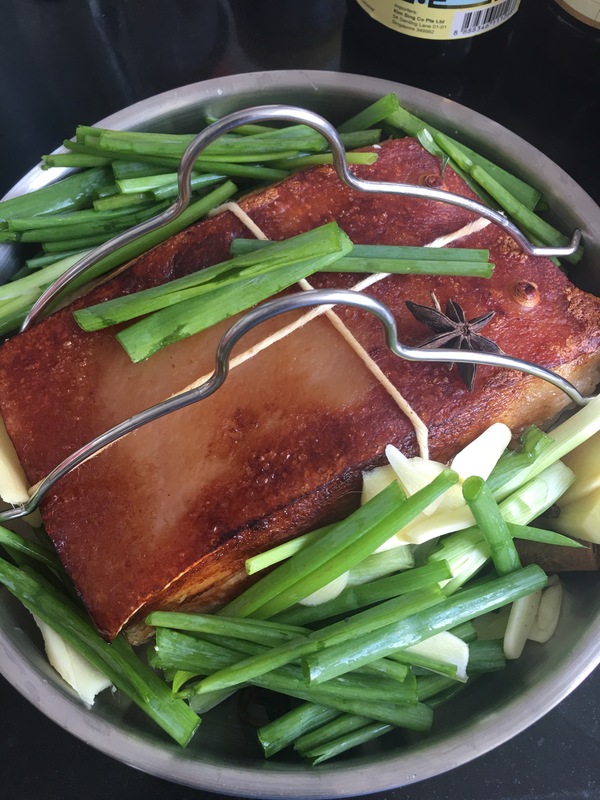 Put the spring onions, garlic, and ginger into the pot-in-pot and the pork belly skin side up on the aromatics. Mix the light and dark soy sauce, sugar substitute, Shaoxing wine and water and pour over the pork belly. Add the star anise, cloves and cinnamon sticks, making sure these are submerged in the braising liquid. Put on manual high pressure for 40 minutes. Do a quick pressure release. Remove the pot from the inner pot. Remove the trivet and drain the water from the inner pot. Slice the pork belly into 1 cm thickness and place in the inner pot. Pour the rest of the braising liquid into the inner pot and put on sauté mode for about 10-15 minutes until the pork belly pieces have soaked up the colour of the braising liquid. Remove the pork belly pieces and set aside. Continue to reduce the braising liquid. Add 1 tsp xanthan gum and stir well for about 5 minutes. Drain the thickened braising liquid with a sieve. Serve the pork belly in lettuce leaves or with Chinese buns for those not on low carb diet. The braising sauce can be drizzled over the pork belly slices and garnished with coriander leaves. Do you have a sous vide version of braised pork with soy? Just me asking. Actually I don’t because I only have a regular vacuum sealer that can’t do liquids with the meat.